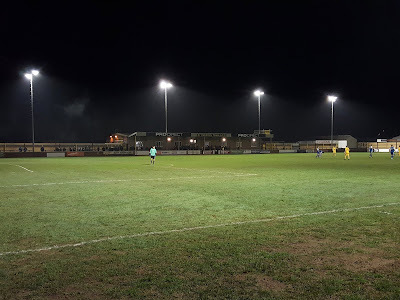 My second ground of 2019 was on Tuesday 8th January at Ladysmead in Tiverton, Devon. 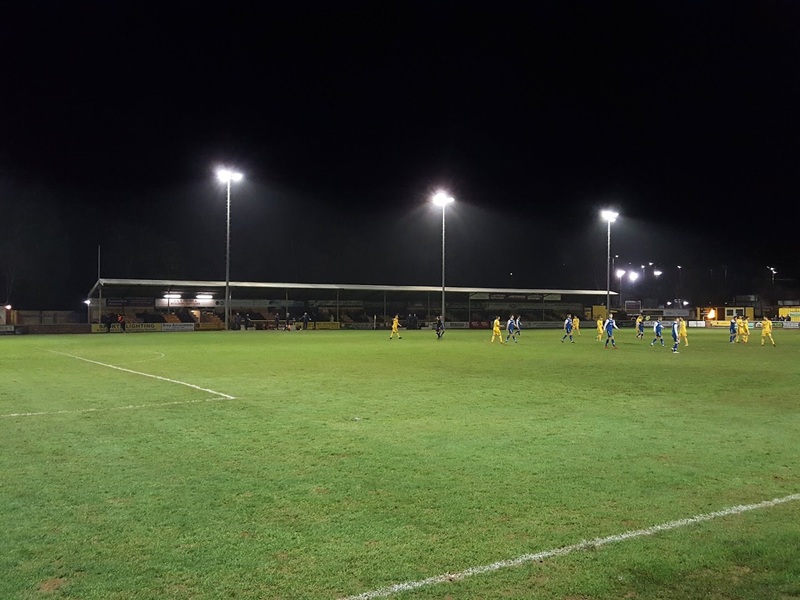 The match was Tiverton Town vs. Gosport Borough in Southern League Premier Division South. Ladysmead is three-quarters of a mile north of Tiverton town centre. Part of a sports area of the town, the ground has the Exe Valley Leisure Centre to the east and Tiverton Rugby Club to the north. The western flank is bordered by a retail park with the southern side by an industrial estate. The town's railway station was closed in the 1960s with the nearest station at Tiverton Parkway. This station, opened in 1986, is actually located in the village of Burlescombe, some 7 miles east of Tiverton. The venue has been home to the club since 1946 when they left their home at The Elms after it was badly damaged during World War II. The main stand takes up two-thirds of the northern side of the ground. This all-seater stand has a total of 520 seats including separate sections for officials. There are a number of supporting beams holding up the roof of this stand and it also sits behind three floodlights on this side. The two dugouts are in front of the stand but have been built down into the ground which prevents them causing restricted viewing to spectators. To the west of the stand is a building contains the player changing rooms while the north-east corner has a couple of club demountables with an electronic scoreboard attached to one of these. The southern side of Ladysmead consists of a two-level shallow concrete terrace for its entire length. There is a covered section in the middle as the roof extends out from the clubhouse behind which includes a well-sized bar. The south-east corner of the ground houses a small club shop by one of the entrance turnstiles. The western side has a 5 row concrete terrace which is uncovered save for a small section directly behind the goal. The eastern end has a 7 row covered concrete terrace which takes up the middle half of this side. The remaining quarters either side of the stand are uncovered hard standing. Both sides went into the evening just above the relegation zone so it was an important opportunity for one to pull themselves further from danger. It took until just the 6th minute for the ball to find the net and it was Tiverton who grabbed it. 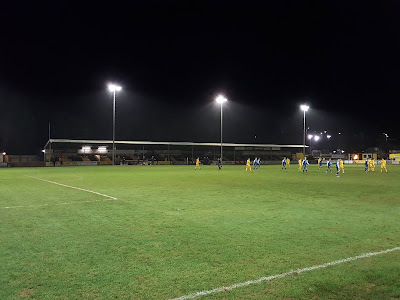 A long ball upfield was met by a lovely flick on by Stewart Yetton and Levi Landricombe smashed a half-volley into the back of the net from 25 yards out. The home side went close to extending their advantage in the 13th minute when a free-kick into the area was met by the head of Michael Landricombe. His looping header was going to sneak over the line until away keeper Patrick O'Flaherty pushed the ball onto the top of the crossbar. 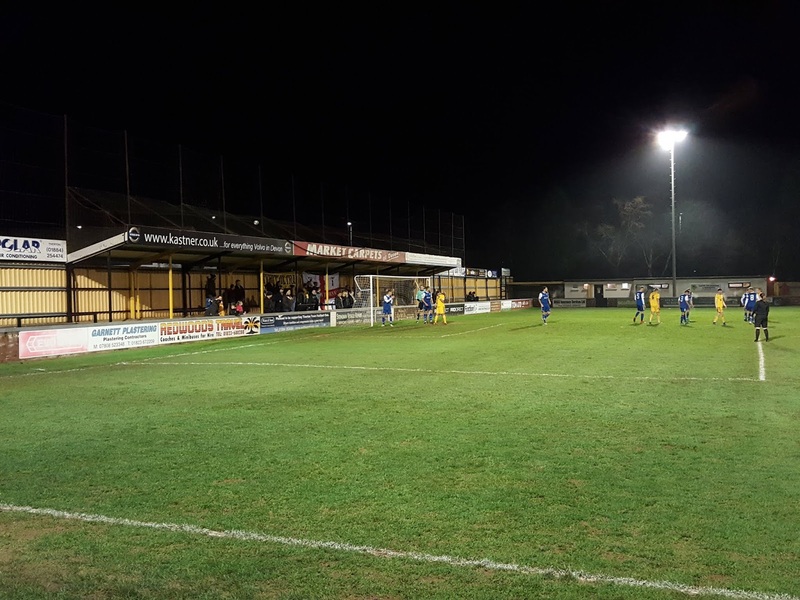 Gosport's first real meaningful attack of the match came in the 20th minute when a free-kick found Harry Medway on the right side of the area and his cross from the byline fizzed across goal but there was no-one on the end of it. 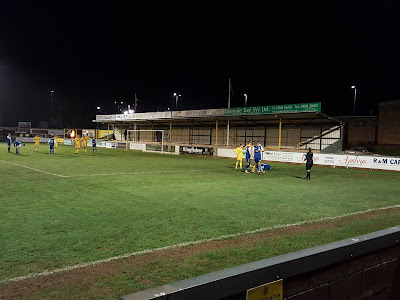 Tiverton were definitely the better team in the first half and generated a couple of half chances around the half-hour mark with some nice play. 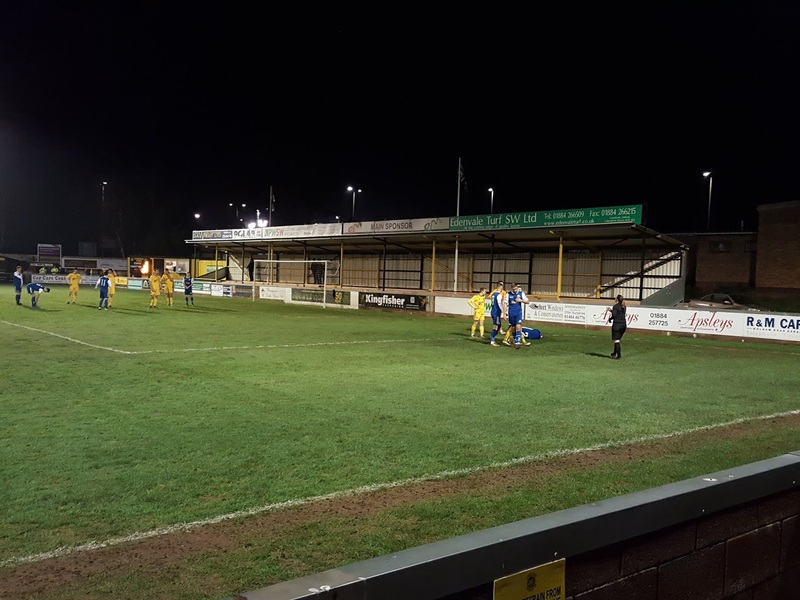 Nothing came of these though and Gosport almost made the home side pay with a great chance in the 35th minute. An excellent ball out wide was picked up by Sam Lanahan and racing towards goal he shot just the wrong side of the post. The away side came out on the front foot in the 2nd half forcing a series of corners in the opening quarter of an hour. Tiverton were happy to defend for the most part though they did generate the best chance of the second period when a free-kick into the area was saved by O'Flaherty but only as far as Yetton who had to react quickly and was only able to send the ball wide from close range. It was a half that failed to really get going, Gosport had lots of the ball but didn't really force home keeper Liam Armstrong into making many saves as the 6th minute strike by Landricombe proved to be the sole goal of the match.